Rain and thunderstorms. High 69F. Winds SSW at 5 to 10 mph. Chance of rain 80%.. Periods of rain. Low 43F. Winds WSW at 5 to 10 mph. Chance of rain 90%. Rainfall around a half an inch. On April 10, 2019 at approximately 6:30 AM Clay County Dispatch was notified of a vehicle pursuit from Jackson County Dispatch heading into the North end of Clay County. 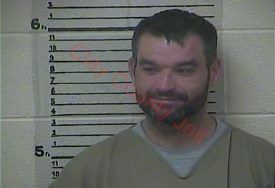 Clay County Sheriff Patrick Robinson and Manchester City Police Lt. Jason Combs intercepted the motorcycle that was fleeing the Jackson County Sheriff and Deputy at the intersection of North Highway 421 and Highway 1350, the motorcycle struck Lt. Jason Combs police cruiser. The driver bailed off the motorcycle once it came to a stop and attempted to flee on foot, once the subject was apprehended he turned on Sheriff Robinson and other officers on scene and attempted to fight. Manchester City Police Lt. Jason Combs deployed his taser, the subject was still combative. The subject was placed under arrest without further incident. Jackson County Deputy Zach Bryant was transported to Advent Health of Manchester due to injuries sustained during the struggle with the subject where he was treated and released. Assisting at the scene was Jackson County Sheriff Paul Hays. The photo attached is courtesy of the Clay County Detention Center.